The Warwick Arts Centre is the largest arts centre outside London and famed for its exceptional programme. Here you will find the renowned Butterworth Hall that provides uninterrupted view of a vast screen and stage for up to 1,200 delegates. It’s the perfect answer for presentations and productions. From familiar meeting rooms to innovative spaces designed to inspire, alongside reliable Wi-Fi, plentiful parking spaces, on-site conference team and even access to the University of Warwick sports facilities including pool and gym. 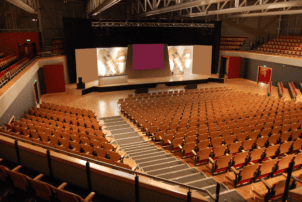 The Warwick Arts Centre is home to a 570-seat theatre, the 250-seat theatre and a cinema. The venue also offers onsite accommodation with 1,200 student style bedrooms and 479 hotel style bedrooms. The Warwick Arts Centre also houses the Mead Gallery. Not only is it famed for its cutting edge exhibitions, but it provides a single space that can also be divided in three, with the pure white wall backdrop that only a gallery can provide. The purpose-built Ramphal Bulding is a stylish, contemporary environment and features 10 seminar rooms, a private foyer and a tiered lecture theatre capable of accommodating up to 400 delegates. Located in the Rootes Building, the Panorama Suite is a versatile, 700m2 exhibition space, with seating for up to 400 delegates for conferencing and a banqueting capacity of up to 600. Book this venue or let us help you find more perfect Venues in Coventry for your event.